We are congratulating our IX Center Piston Power Logo Kontest winners! These great artists won money and bragging rights for this year’s show. 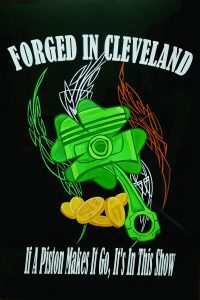 First place and the design that will be on all the event shirts came from Jill Welsh. She will also be awarded a check for $500! 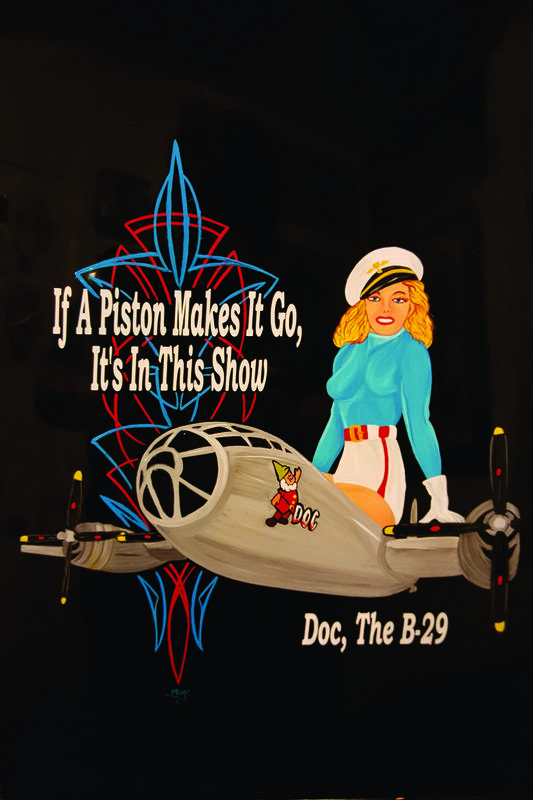 Second place was also won by Jill and the Piston Power Show will add $250 to her check. Third place was won by Tracey McKenzie, who won $100. Congratulations to our Krazy Painters! We WILL be doing this again next year so start watching around May for the official announcement. It’s an easy contest to join and we may be talking about YOU next year at this time. Gonna join in??? Big bucks and bragging rights can be YOURS!!! This entry was posted in Uncategorized on January 8, 2018 by John Carollo. These brave souls won money and bragging rights for next year’s show. 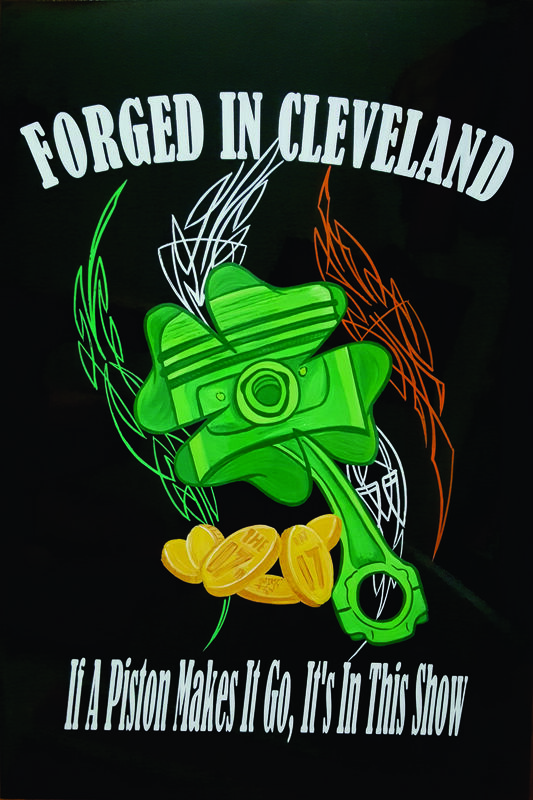 First place and the design that will be on all the event shirts came from Jill Welsh. She will also be awarded a check for $500 at the show! Her kool design is on the left. Second AND third place were won by Maggie Marquardt and she will take home the checks for $250 and $100. Her Kool designs are in the middle and right, respectively. Congratulations to our Krazy Ladies!! This entry was posted in Uncategorized on June 20, 2016 by John Carollo. Thanks to our friends at Big Al’s List (.com) for once again posting a BUNCH of pics from our latest show. Photos By Ashley Hamilton and Bobby Evans. Thanks, guys! This entry was posted in Uncategorized on April 23, 2016 by John Carollo. Krazy Paint’s goal is to create a World Class Charity Panel Jam – pure and simple. 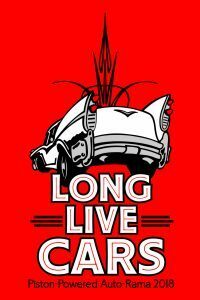 To continue to live that philosophy, we are very happy to announce we have been graced with some of the big names in pinstriping who have expressed an interest in helping KP reach our goals. Working with these folks as well as other shows will help all of us in the many things we work for in our Jams. The first new Krazy Paint Konsultant is none other than Sir Jack Lindenberger. Known for his tremendous talents and helping folks industry-wide, Sir Jack brings his valuable experience in both painting and Panel Jams to KP. Our second Krazy Paint Konsultant is none other than East Coast Artie Schilling. Artie is another one of those talented painters that is at home on signs as well as lines. Along with his tremendous painting talent, Artie is also known for his very famous Artie’s Party in Syracuse, NY, one of the top Charity Panel Jams in the country! Truth be told, Artie has been helping Krazy Paint for years, and we thank him for that. Our latest Krazy Paint Konsultant is Von Dago. From almost 50 years behind the brush to designing brushes, the ‘Dago has done it all. There’s not much he can’t do with his brushes and he’s not afraid to share that extensive knowledge. He has thrown in with us and will be at the 2017 show to sling paint and make the show better for everyone. We thank Sir Jack, East Coast Artie and Von Dago for signing up with us and helping better Panel Jams everywhere. Regardless of what Jams you attend, we are all in this together to raise the awareness of our unique art. This entry was posted in Uncategorized on September 10, 2015 by John Carollo. 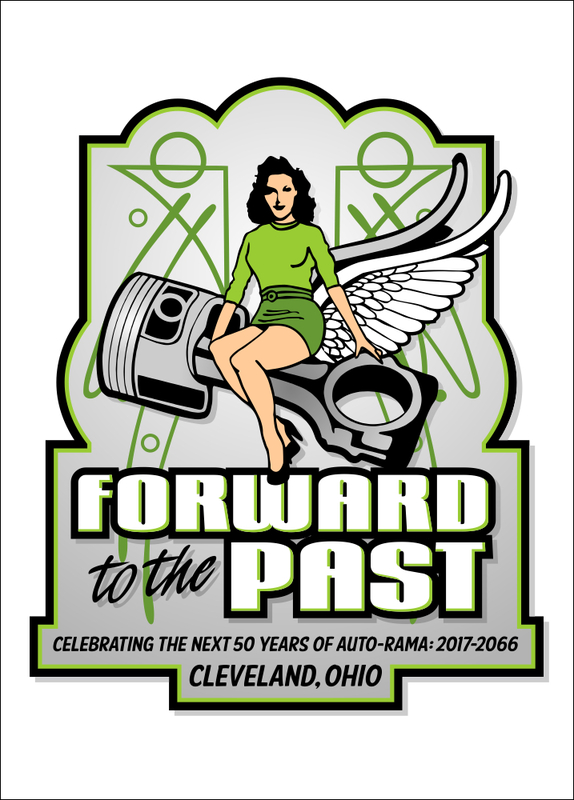 2016 Piston Power Auto-Rama Logo Kontest Winners! 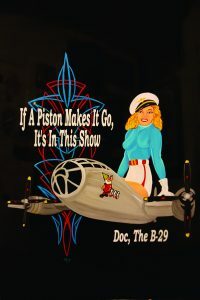 The IX-Center and Krazy Paint launched this kontest for the 2015 show where the basic idea was for Krazy Paint artists to design the logos for the show. 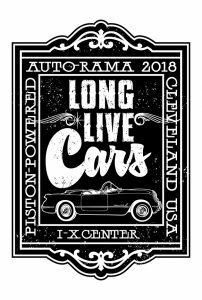 The second annual Piston Power Auto-Rama Logo Kontest is history and first place goes to Sir Jack Lindenberger! Sir Jack also nabbed second place! WOW! Third place when to our own Fat Daddy and Honorable Mention went to Alex Hamilton with his two entries. Jack’s winning design will be on all the show’s official Tee Shirts. How Kool is that? Plus, the top three entries won cash prizes, too! Along with the winning design appearing on the show’s T-shirts for all to see, a portion of those sales will be donated to our charity, The Career and Technical School Foundation. The winning entries will be auctioned off and that money will also go to our charity. 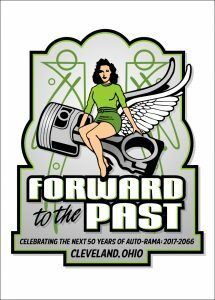 What a great way to celebrate the 50th Anniversary of the Cleveland Auto-Rama! 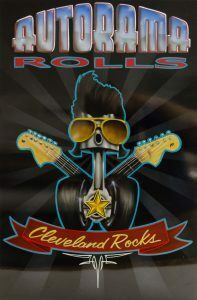 Krazy Paint is honored to work with such kool artists! Thanks, guys! This entry was posted in Uncategorized on June 16, 2015 by John Carollo. Krazy Paint Returns with Our Two Exclusive Awards! We put the Charity Panel Jam World on notice with these babies! Your fave Charity Panel Jam originated two brand new and exclusive awards for our painters. These two awards can only be found at Krazy Paint and they’ll both be presented at Summit Racing I-X Center’s Piston Powered Auto-Rama in Cleveland, Ohio, March 16-18, 2018. The Mack Brush Boss Award goes to the painter that sells the most pieces of art at Krazy Paint. The winner gets a Kool, Kustom-made Mack Brush Boss trophy and a Gift Certificate good for $150 of Mack Brush products. The 1 Shot Hot Shot Award goes to the painter who’s one, single piece brings in the most money at Krazy Paint. That winner gets a Kool, Kustom-made 1 Shot Hot Shot trophy and $250 of 1 Shot Paint. Krazy Paint is proud to announce both 1 Shot and Mack Brush have returned to recognize two great painters for their talent and hard work. Check out the rules and have a blast! 1. To make it better for everyone, no one person can win more than one award. In case of tie, the runner up will get the award. 2. The 1 Shot Hot Shot and Fat daddy Donut Hole Awards will be kept separate. We’re the Panel Jam that rewards artists the most! And there’s more to come with three new awards for 2018! This entry was posted in Uncategorized on January 31, 2014 by John Carollo. Cassandra Seth is our Auctioneer! We are proud to announce Cassandra Seth, well known professional auctioneer and friend to the pinstriping community, has joined our family as the Auctioneer for Krazy Paint! Cassandra brings her vast knowledge and impeccable integrity to any auction she holds and did a great job raising money for our charity; the Career and Technical School Foundation (CTFS). Friends of Cassandra are welcome to join us! This entry was posted in Uncategorized on November 13, 2013 by John Carollo. Learn to Paint With Our Own Fat Daddy! One of the things we had in mind when we started Krazy Paint was being an even bigger part of the pinstriping and custom paint community. We’re also here to encourage new painters to pick up that brush and join in the fun! So, our own Fat Daddy has put up this vid, showing how he starts off with a simple design. This entry was posted in Uncategorized on October 1, 2013 by John Carollo.